SOUTH BEND, Ind. 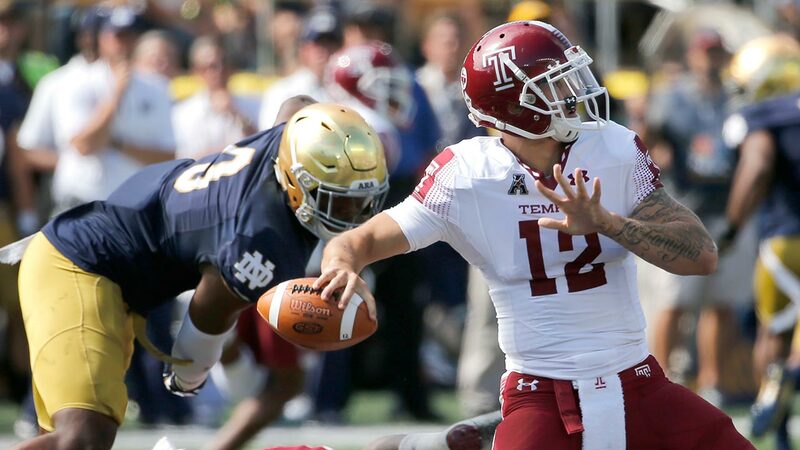 -- Notre Dame got just about everything it could have hoped for in an opening game coming off a disappointing 4-8 season: solid play on defense, three 100-yard rushers and first-time starter Brandon Wimbush throwing for a pair of touchdowns in a 49-16 win over Temple on Saturday. "When you can exhibit some of the perseverance and the grit that we showed that is needed to have a successful season, that's a good day for me," Notre Dame coach Brian Kelly said. It was a different story for the Owls under first-year coach Geoff Collins as Temple struggled throughout. "There have been a lot of fun moments and some exciting moments I was really looking forward to as a first-time head coach, and this was not one of them," Collins said. "We came out slow early. At halftime, I told the kids we had a lot of rookies out there and I thought I acted like a rookie early." Wimbush, a junior, threw touchdown passes to Equanimeous St. Brown and Nic Weisher and completed 17 of 30 passes for 184 yards with one interception. He also ran for 106 yards on 12 carries, including an 8-yard touchdown run. "I thought that for a guy starting for the first time, he provided some excitement and energy to the offense," Kelly said. "I think everybody that watched him can see the tools that he has; the ability to run, throw the football. He's tough. He got hit today. He got back up. Again, I think when you assess the quarterback position at the end of the day, they are going to assess him on wins and losses and today was a good day for the quarterback at Notre Dame because we are 1-0." Wimbush said he wasn't surprised by anything he saw. "I'll be sore tomorrow, but right now I'm great physically, mentally, emotionally," he said. Josh Adams scored the quickest opening-season touchdown for Notre Dame in 24 years and rushed for 112 yards in the first quarter alone to get the Irish started. Adams finished with 161 yards rushing on 19 carries and Dexter Williams added 124 yards rushing on six carries. "We just came out with intensity," Adams said. "We trusted in our training and everything we've been through the offseason and just going out there and having fun and forcing what we wanted to happen." Adams scored on a 37-yard run 33 seconds into the game, the fastest touchdown to open a season for the Irish since linebacker Pete Bercich returned an interception 21 yards on the opening play against Northwestern in 1993. It was the quickest offensive touchdown for the Irish to open a season since at least 1963. Wimbush set up the touchdown run with a 33-yard pass to St. Brown on the first play. "That first play was huge for my confidence," he said. Temple: It was an inauspicious start for Temple under Collins, the defensive coordinator at Florida the past two seasons. The Owls struggled offensively and defensively and had several costly penalties. It was a disappointing start after posting back-to-back 10-4 seasons under coach Matt Rhule, now coaching at Baylor. Notre Dame: The Irish looked better in their opener than they did at any time last season, but there's still plenty of room for improvement. The Irish offense went dormant after jumping to a 28-3 lead early in the second quarter until Tony Jones Jr. scored on a 7-yard run with 1:22 left in the third quarter. Justin Yoon missed a pair of long field-goal attempts. He missed four attempts all last season. Temple: The Owls face crosstown rival Villanova at Lincoln Financial Field, the first meeting between the two Philadelphia schools since Temple beat the Wildcats 41-10 in 2012. The series is tied 15-15-2. Notre Dame: The Irish host No. 15 Georgia, only the second meeting between the two schools. In the first meeting, the top-ranked Bulldogs beat No. 7 Notre Dame in the Sugar Bowl to win the 1980 national championship.